Everyone needs encouragement from time to time. In fact, I find myself turning to the best of my friends, and pouring out my entire subconscious; pouring out my heart. Everything I have seen, everything I have heard, and everything I feel–they know about. AND Usually at the conclusion of our conversations, we dialogue about their thoughts and observations, and as a friend, they provide me with some valuable constructive criticism. It’s not always enjoyable. In fact, my best of friends, tell me how it is–and do not “candy coat” the truth–no matter how painful. After all, we know life is a battle. In the book of Exodus, chapter 17, the Israelites were about to go to battle. And Moses, being the mouthpiece of God and one of Elders of the Israelites, gathered his men for battle. In the face of the battle, Moses interceded for the Israelites in prayer. The Bible says that when Moses’ hands were raised, the Israelites would prevail in battle. However Moses grew fatigued. When his hands would lower, the Israelites would begin to lose. So his trusted friends and fellow leaders, Aaron and Hur, came beside Moses and lifted his hands for him. How many of you have friends like Moses. People who will come along side you and lift your arms up. If you have those friends who love and support you AND are real enough to correct you and give you constructive criticism–KEEP THOSE FRIENDS! But how many of us have the tendency to plant people around us that tell us what we want to hear. Those people we strategically place in our lives that ENABLE US in an unhealthy way. I call those people “yes friends” because that’s all they do–is agree with you. They compliment you. Thy laugh at your jokes. They don’t call you out even if your wrong. They are actually negative attributes in our lives because instead of holding us accountable, they actually hurt us with their passivity. For those of you who know what I am talking about; it is our own insecurity that puts those people around us. And through the battles, instead of holding our arms up like Moses, they hold up our egos; when God calls us to be humble and contrite. I get it. The fight is real. And sometimes we feel like our egos need to be fortified; but consider the kind of battle you’re in. And consider who you put around you. It is our insecurities that lead us to trust people we barely know. And we stop trusting our long time friends because they hear our burdens over and over and over again. But consider who you let into your life. Be careful who you trust. Because in the deepest darkest and loneliness moments–you know who your real friends are. And if you don’t, Remember that God loves you. The Bible does encourage us to cut off those things in our life that hinder us; (Matthew 5:30). The scripture says “if your right hand causes you to sin, cut it off…” But be sure you’re not cutting off or cutting out essential pieces of your life because some things don’t grow back. Hold onto those that encourage you in the Lord, and not those that massage your ego. I know brokenheartedness makes us deviate. But God is our stronghold. 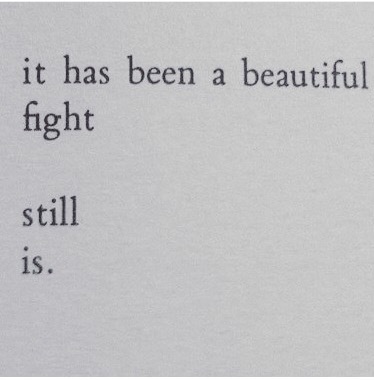 Because life is a beautiful fight.